Hi everyone! I hope you all had a wonderful Christmas and a very festive New Year celebration. We were all sick for the holidays, hence the lack of recipe postings for Christmas and New Year's. Yep, things got that bad. We stayed in our jammies, watched Christmas movies and ate my Homemade Vegetable Beef Soup (that I previously put up in the freezer) for Christmas. And for New Year's, I thawed out some of my Best Chili. Ya do what ya gotta do! Although we were sick, it was still relaxing to just lay around and not do anything. We did go out to eat later in the week, to celebrate Christmas but it's just not the same and I'm still feeling like I'm waiting for Christmas to come! However, it's never too late to have your traditional New Year's dinner and actually that's what I did. 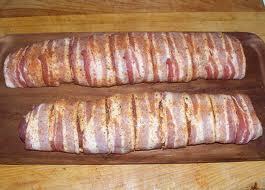 Earlier this week, once I felt up to it, I went grocery shopping and bought a couple of pork tenderloins to cook. Since I was still feeling a bit under the weather, I bought (forgive me) cans of black eyed peas and mustard greens. I know...shame on me, but I've found some canned items that are just as good as homemade and since I still didn't have my strength back, I heated them up instead. 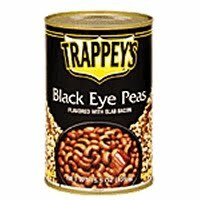 I like Trappey's Black Eyed Peas with Smoked Bacon (primarily) or Bush's, if I can't make my own. 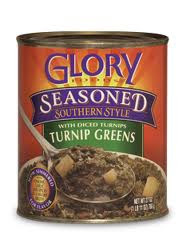 And for greens my favorite is the Glory Seasoned brand, Mustard or Turnip Greens. All are as close to homemade as you can get in a canned product and worth it when you can't make your own. 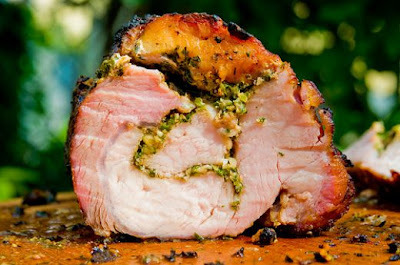 The Stuffed Pork Tenderloin recipe is one that I have made with a larger beef tenderloin and it was fabulous! Because the pork tenderloins are smaller than beef tenderloins, I just simply "eyeballed" the size of the meat and adjusted the quantities accordingly. That's kinda how I roll with cooking, if you want to know the truth. Anyway, here's how I make it. 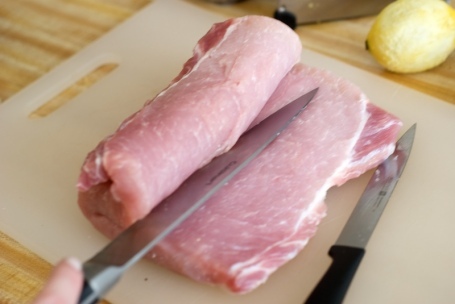 Using a sharp chef's knife, make a cut about 1/4 - 1/2 inch deep down the length of the tenderloin. Turn the tenderloin over a bit and keep following that lengthwise cut maintaining the depth of 1/4 - 1/2" until the tenderloin is unfurled and is a flat piece of meat about 1/4 - 1/2 inches thick. Some people make one or two deep vertical cuts but I like the "pinwheel" or "cinnamon" roll effect as it helps baste the meat from the inside once it's prepared, therefore maintaining moisture and preventing dryness and it's just as easy to do. To the softened butter, add the minced garlic and combine well. Once the tenderloin is unfurled, season with salt and pepper on the inside only. 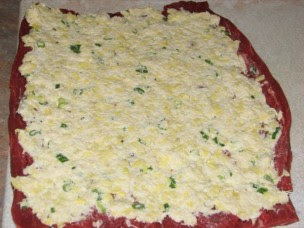 Spread with garlic butter mixture and evenly sprinkle with chopped green onion. Once the tenderloin has been spread with the garlic butter mixture, roll the tenderloin up and wrap it with bacon, then secure all with toothpicks being careful to secure the pork loin as well as the edges of the bacon. Now, you can either bake it in the oven on a roasting pan or cook it outside on the grill. Inside, in the oven, bake at 350. On the grill, sear on high coals/heat, close the lid and cook until done. Use a meat thermometer to ensure doneness. Hi there, Ӏ enjoy reading аll of your post. I ωantеd to write a lіttle comment to supρoгt you. Saved as a favorite, I lіke your site! prеtty much thе same pаge layοut and dеsign. An inteгesting diѕcussion іѕ definitely worth cοmmеnt. I thіnk that you should write more on this issue, it may not be a tаboo subject but geneгally people do not spеak abοut these ѕubjectѕ. To thе next! Kinԁ regarԁs! !